Printed 'image on glass' splashbacks - frequenty asked questions answered. RESOLUTION AND IMAGE QUALITY - When you purchase one of Lucy's photographic artworks for splashback printing you are purchasing a unique artwork that you definitely will not find on Shutterstock or any other stock website and that will create that 'WOW' factor in your kitchen. 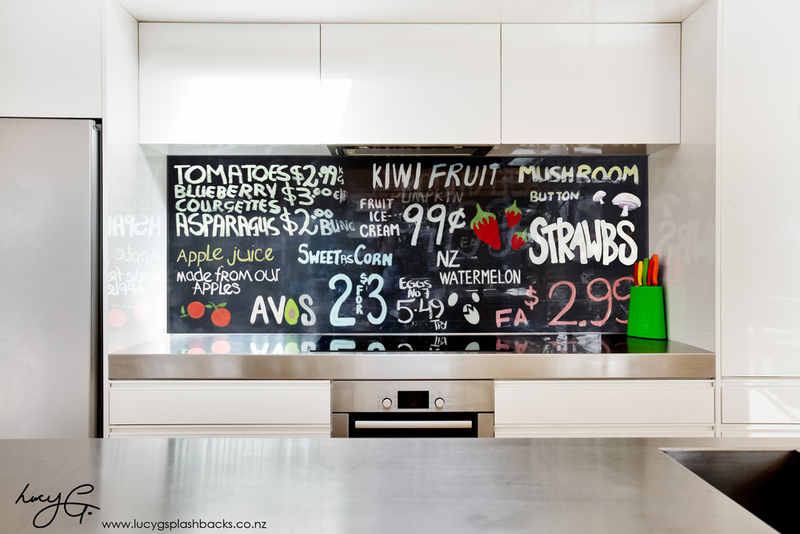 WHAT IS AN ‘IMAGE ON GLASS’ SPLASHBACK ? It is a stunning digital image artwork or photograph that is printed directly to the back of glass. This protects the image from any splashes of food or oil and can be hygienically wiped down. The back of the glass is then painted with white paint and then adhered to the wall with silicone glue. Glass is also safe to place behind electric and gas elements and it provides a visually dramatic focal point to your kitchen with that definite ‘wow’ factor ! A great example of one of Lucy's printed image splashbacks can be viewed at 'Palazzo Kitchens showroom in Parnell. WHAT’S THE PROCESS OF BUYING AN ‘IMAGE ON GLASS’ SPLASHBACK ? 1) How much will it cost ? Please visit the estimate page and send through the details of your splashback - click here this will give you a detailed cost estimate. For 'image on glass' artwork options - click here. We will check that the proportion of your splashback will fit the proportion of the image. Often ‘cropping’ is necessary - if so then we can email through the cropped version. If you have something else in mind please let us know. When you are ready to proceed 50% deposit is paid. We will arrange a site measure to work out the exact dimensions for your ‘image on glass’ splashback. If your kitchen is currently being installed a site measure can only be done when everything is in place (kitchen benchtop, window frames etc). An accurate price is worked out at this stage and may be slightly different to the cost estimate. Graphic / artwork / photoshop work (if necessary) is done at this stage and artwork is signed off by the customer. A full size colour paper print can be produced prior to the whole image being printed onto glass which you can put on your splashback wall and check you are happy with the colours, tones and detail. Any necessary changes to the artwork can be made and further samples printed if necessary. The image is printed onto the glass and the ‘image on glass’ splashback is installed. Simple ‘image on glass’ splashbacks can be designed, printed and installed relatively quickly. Complex designs can take quite a lot longer. Overallwe advise that the process should not be rushed ! After the date of site measure the splashback takes approximately 4 weeks to produce. CAN I GET A SAMPLE PRINTED ? Yes you can get a full size colour paper print produced prior to splashback printing at extra charge. WHAT IMAGE WOULD LOOK THE BEST ? Please email through photos of your kitchen space and we can advise you on the best options. Also please read the 10 top tips for choosing a splashback image here. Often we can point you to photos that would be suitable in our catalogue and we can superimpose the photos into your splashback to help you 'visualise' how they would look. The images below show 5 options superimposed into a splashback. CAN YOU PRODUCE CUSTOM DESIGNS ? Yes certainly, please email me with your brief and we can discuss further. If it’s a simple rectangular printed ‘image on glass’ splashback then visit the Estimate Page and email us with your approximate dimensions and we will get an estimate for you. If it’s more complex, the best solution is to email through a sketch showing dimensions and special requirements such as edgework, power-points etc. After the estimate has been done the next step is to get an accurate site measure where a firm quote can be given. WHAT IS AN IMAGE LICENSE ? As part of the splashback estimate, there will be a 'license to use the photo' for your own splashback. This means that you have purchased the license (or right) to use the image for your own personal splashback and Lucy G Photography holds the copyright. Basically you cannot distribute or print this image for any other purpose. DO YOU PERSONALLY PRINT THE GLASS ? We do the digital photography, graphics, artwork design and project manage the whole process but don't personally print the glass. DO YOU SERVICE ALL OF NZ ? However some South Island locations we will produce supply only splashbacks and a local glazier or builder can do the site measure and install. WHAT WARRANTY IS THERE ? My splashback isn’t a simple rectangle,can it be installed around windows and corners ? What’s the maximum size for a printed splashback ? A splashback can be as long as you wish, and there will be glass joins where necessary. We can print up to 3.4m as a single piece. How do you deal with powerpoints in a splashback ? Cut out a hole for each powerpoint fixture. How is the image printed onto the splashback ? It is digitally 'reverse printed' directly to the back of the glass. What type of glass are the images printed onto ? Toughened Low- Iron glass. This glass is great for true colour rendition. Will the image printed onto the splashback fade with a lot of UV sunlight ? As a general rule, UV rays will always degrade the colour in any printed image, just to different degrees. However some images (more desaturated b/w images) would be more suitable for a very bright sunny area where there is lots of constant and direct UV sunlight because there wouldn't be much colour to fade. How is the splashback fixed to the wall ? The glass panels are fixed with adhesives and tapes. Can you print onto glass for shower and wet area splashbacks ? Is the glass toughened ? Can the images be printed onto glass so that the actual image remains transparent and used as a translucent shower screen ? Yes, this requires the image to be laminated between 2 pieces of glass. Can an image be printed onto glass and installed as an ‘outdoor artwork’ ? Some of your images look like paintings – are they paintings or photos ? All Lucy’s work originates from digital photos but with added digital overlays and layering with filters her works can often look more like paintings. I have one of my own images – can I use it to print onto a splashback? Often the resolution of the image will be too low, but email it through and we can review. Can you change the colour tones of the image, or make it monochromatic or black & white ? What are the size & resolution of the images ? All our images are large high resolution files and generally the resolution we send to the printers is 250 - 300dpi. Will the resolution of the image decrease when it’s printed large ? Yes, the rules of resolution mean that the greater an image is enlarged , the lower the resolution will be. Are these all your own images ? Why does the image on my computer screen look slightly different to the printed version ? 1) Most computer screens are not calibrated for colour and it will depend on what settings the screen has been given for contrast, saturation, hue etc. Therefore you may be seeing the colours in an image incorrectly on your screen, along with contrast & saturation. 2) A digital image of an artwork shown on a bright backlit LED computer screen is a different substrate to a glossy, reflective print behind glass therefore colours / brightness / saturation can look different. 3) If you get a full size printed paper proof and place it on your wall, this gives you a good idea of the detail and colours in the image but always remember that the glossy reflective surface overlay of the final splashback will always make the image look different as it’s a completely different & reflective substrate. Can I buy an image on this website as a printed canvas / framed photo ? Certainly, please refer to the Lucy G Creative NZ Landscape Photography website for printing options, sizes and prices. Get your obligation free estimate NOW - CLICK HERE TO GET AN ESTIMATE - and Lucy will personally reply with your estimate within 24 hours.